As usual, during "El aperitivo" we will have the presence of very young musicians. On this occasion of the Professional Conservatory of Music of Segovia. 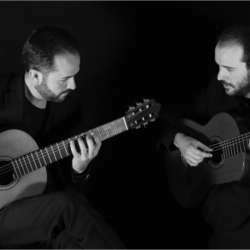 And then the "Madrid Guitar Duo" with a stimulating repertoire of 20th century composers, including Piazzolla or Tedesco, among others. Here below I leave you the link with all the information. As always, after the concert we can go up to the cafeteria for a drink.